The Glacier Bay Farrington Free-Standing Tub Filler Faucet in Polished Chrome features a contemporary style design with a showroom feel, that will compliment a variety of bath dicor. Its single lever handle meets ADA standards for ease of use in adjusting water temperature and volume. It also features a sleek single function handshower with a 60 inch stainless steel hose for your convenience. This stylish faucet will make for a great addition to an elegant master bath and free-standing tub. Pair with other pieces from the Farrington Collection for a complete and polished look. Glacier Bay products are manufactured with superior quality standards and workmanship and are backed by our limited lifetime warranty. Glacier Bay products are warranted to the original consumer purchaser to be free of defects in materials or workmanship. We will replace FREE OF CHARGE any product or parts that prove defective. Simply, return the product / part to any of The Home Depot retail locations or call 1-855-HD-GLACIER (1-855-434- 5224) to receive the replacement item. Purists will love the GROHE Allure faucet with its pared-down lines and graceful spout. It is original and highly authentic, delivering a natural water experience. Allure is a faucet for modern living, a pure, unspoiled design that is matched by two of GROHE's unique technologies: GROHE SilkMove, for an unbeatable smooth performance, and GROHE StarLight for an intense shine. It is a covetable combination of true craftsmanship and pristine style a truly alluring product. For individuals attracted by clean, simple and visually pleasing designs, Essence Floor Standing Tub Filler offers superior aesthetics without pretension. The AquaGuide technology allows the user customize the angle of the water flow between 20 and 400 to avoid splashing back against the basin. Its unspoiled design is matched by unique GROHE technologies: GROHE SilkMove for a lifetime of smooth operation, for unbeatable smooth performance, and GROHE StarLight finish for scratch and tarnish-resistant surfaces for a lifetime of beauty for an intense shine. It is a covetable combination of craftsmanship and pristine style - a truly alluring product. Farrington Single-Handle Floor Mounted Tub Filler Faucet and Handheld Shower in Chrome The Glacier Bay Farrington Free-Standing Tub Filler Faucet in Polished Chrome features a contemporary style design with a showroom feel, that will compliment a variety of bath dicor. Its single lever handle meets ADA standards for ease of use in adjusting water temperature and volume. 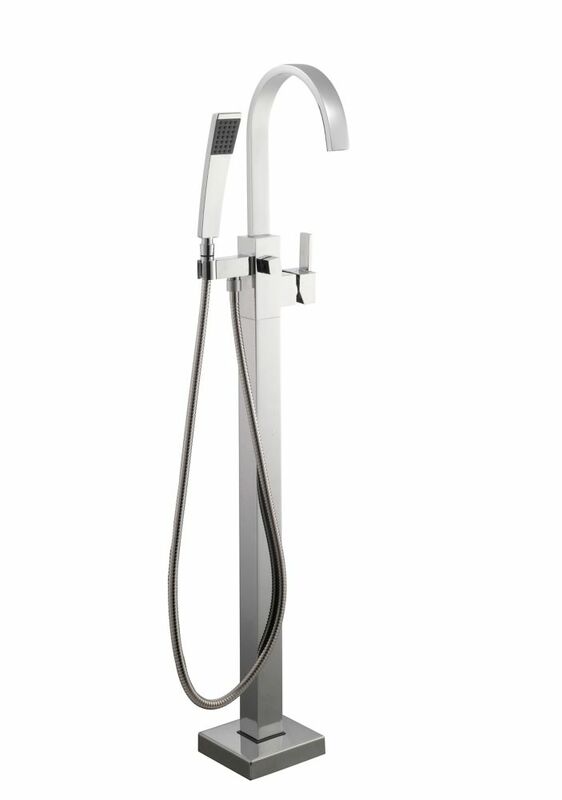 It also features a sleek single function handshower with a 60 inch stainless steel hose for your convenience. This stylish faucet will make for a great addition to an elegant master bath and free-standing tub. Pair with other pieces from the Farrington Collection for a complete and polished look. Farrington Single-Handle Floor Mounted Tub Filler Faucet and Handheld Shower in Chrome is rated 4.0 out of 5 by 2. Rated 4 out of 5 by Yosi from Great product I just installed this unit in our new bathroom that I renovated myself. The product looks very nice and work well but I had issues with the installation. The 3 screws that support the main unit to the floor came with 3 Philipps head screws. When I tried to screw them to the floor the heads stripped very easy. I will have hard time removing them some time soon and replacing them with 3 socket head screws, I think these should be a better quality SS socket head so it will be more reliable and easier to install as these screws have high torque when screwing them into the floor. The other issue I had is how to connect the 2 houses under the floor. Had 2 plastic input houses coming from under the floor and when attaching them to the unit I had to push them hard under the floor through a small opening and that was not easy. Hope the manufacturer take a note of that and will improve these.Other than that great product. Thank you. These units come with a Limited Lifetime Warranty so we urge customers to contact our Customer Service Call Center if there is ever an issue with a Glacier Bay product so that they can troubleshoot as well as provide any parts that might be needed, free of charge, under the warranty. They can be reached at 1-877-527-0313 Monday thru Friday from 8:00am to 7:00pm and Saturday from 9:00am to 6:00pm EST.